Let us briefly introduce who we are and why we share our expertise in digital health. We are nine buddies working at Buddy Healthcare who are passionate about delivering better experiences for surgery patients. Hi there and welcome to Buddy Healthcare’s blog, buddy! Firstly, we appreciate that you landed to our blog. Secondly, we would like to thank you for your interest in digital health. In this blog, we promise to equip you with ideas and thoughts revolving around hot topics, such as patient engagement, enhanced recovery pathways and care management. We admit, we like to dig a bit deeper into surgeries and surgery care since that’s our expertise, but there’s a lot more to come! Let us briefly introduce who we are and why we share our expertise in digital health. 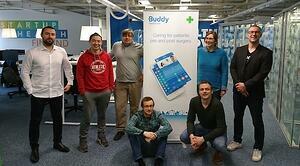 We are nine buddies working at Buddy Healthcare who are passionate about delivering better experiences for surgery patients. We are a Finnish company — however, five of our buddies are originally not from Finland! A cross-cultural, versatile and highly talented team gives as a unique position to address the challenges of the market. So why this blog? We want to share our experience, expertise, opinions and insight about the issues we have faced in healthcare during the year of joyride that we’ve been working at Buddy Healthcare. In the next posts, we’ll explain how we came up with the idea of Buddy Healthcare and what steps have taken us to where we are now. Leave a comment below, tell us what you’d like to hear and stay tuned!